A tasty cilantro sauce enhances the wonderful grilled flavor of the fresh vegetables in this easy recipe. Soak 12 wooden skewers in water for one hour. In food processor, combine cilantro, parsley, scallions, garlic, and lime juice. Puree until finely chopped. Add yogurt and sour cream and puree until smooth. Season to taste with salt and pepper. In a small bowl, stir together olive oil, garlic, and ginger root. 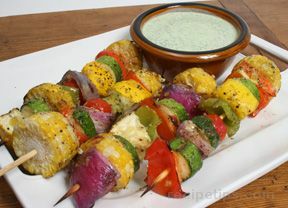 Arrange vegetables on 12 skewers and baste with the oil mixture. Season with salt and pepper.